Sometimes we don’t feel like we have purpose. Do you know the feeling? It often comes when you evaluate your life; your job, your family, your social life, etc and you wonder ‘What’s the point?’ The evaluation comes out with a conclusion that sounds like the repeated phrase in the book of Ecclesiastes, ‘Meaningless, meaningless, everything is meaningless’. Sometimes, we can get to the point where our life evaluation ends up in depression as one feels this never-ending pit in the stomach that doesn’t want to leave. 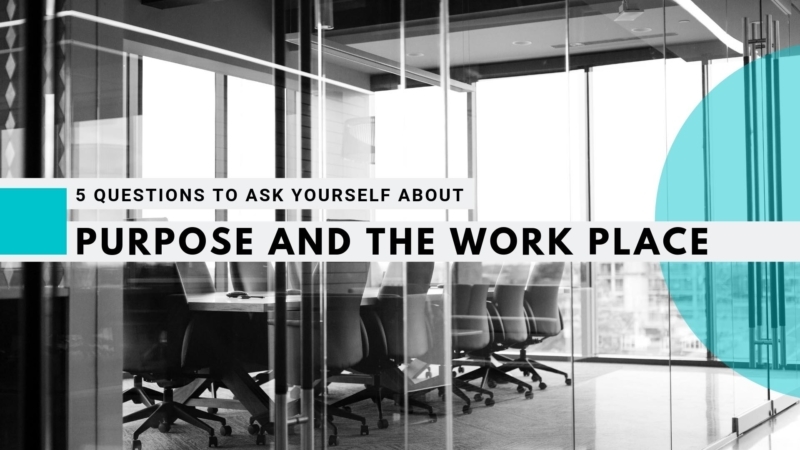 In light of this, I’ve written down some questions that you may want to ask yourself in order to help you with this problem of purpose. Not all the questions may apply to you, but maybe one or two of them will. 1. Does your job make or break your identity? In our culture, people are defined by what they do. It’s the reason why, when you ask someone ‘What do you do for a living’, they’ll often respond with ‘who they are’ and not ‘what they do’. For example, they may answer you with, ‘I’m a captain’ and not ‘I sail boats’. Due to this, when people find themselves in a job that they don’t enjoy, they feel like they are not doing what they are supposed to do. They’ll look at those around and feel like ‘everyone else seems to have found their niche in life’, but they haven’t. They feel like they’ve failed. They haven’t fulfilled what they were supposed to in life. The opposite can be true as well. You can look at your job and truly love it, thinking that you were born to do this and as a result, it becomes your everything. It takes up all your time, becomes the center of your prayers, and you feel that if you don’t succeed, not only will the world around you fall apart, but you will fall apart. Your identity will crumble, because you are not achieving your purpose. The bible reminds us that our identity is not in our occupation, it’s in God. When we give our lives to Christ, we become a ‘new creation’, where the old person we were is now replaced with a new person that is ‘in Christ’ (2 Corinthians 5:17). If we are ‘in Christ’, then our purpose is no longer wrapped up in our occupation, it’s wrapped up in living for God. This doesn’t mean we stop our jobs, rather, it means we work differently. To understand that, you need to look at question 2 and 3. 2. Is your life God centric? If, as we’ve answered in question 1 we see our identity as being in Christ, than how does that change us? The short answer is that it changes our purpose to live for God and others rather than ourselves. We are saved to do the good works he intended (Ephesians 2: 8 -10), yet very often I find Christians (or people who claim to be), still living for themselves and they treat God like a slave. Often the lives of these people revolve around their jobs and when things aren’t going well, they pray to the Lord with the thinking that it’s his job to answer prayer. If he doesn’t, then they question what they are doing wrong with the relationship between them and God, because God doesn’t seem to be doing what he’s told. What these people are doing is the complete opposite of what a life in Christ looks like. In their eyes God must worship them, instead of them worship God. If you do this, God may appear to not answer some prayers as he’s a God who serves (Mark 10:45), but he’s not a slave who will bow to your every demand. For example, you may think that your purpose in life is your job and you’ll continually pray that you grow in the company for your own success. However, God doesn’t worship you and may decide your business doesn’t succeed. At this point you may feel you’ve lost your purpose and have an anger for God caused by a wrong understanding of his role and yours. You are meant to live for God, not God for you. This does not mean that God hasn’t answered your prayers, rather the Holy Spirit looks within us when we pray, He sees what we need and God answers Him (Romans 8:26). Nor does this mean that God won’t or doesn’t desire success in your job. However, you need to realise who you are in Christ, change your view to one where he is the most important and read question 3 to see how you should view your job. 3. Is my role as a working Christian more than evangelism and tithing? In Genesis 1 and 2 we are told that we are made in God’s image. We may not look like God, but we reflect a lot of his characteristics. We have intelligence, we have love, we are creative and we work! When God created the world, he didn’t sit back on a couch and let it happen, instead he was active in creation, speaking its form into being. Therefore, when we work, we are reflecting God to the world and when we do that, he is proud. Like a proud father who sees a child reflecting his good character traits, so God is proud of us when we reflect his ability to work. This means our dignity in our jobs comes not from what job we do, but in the way we reflect our king. It doesn’t matter what work we do (unless it is unethical), we are reflecting God to the world and that means that all jobs hold equal dignity. You may feel that your job is not as valuable as someone else’s and that may make you feel like you are in the wrong occupation. If you do this, you are looking for value in the wrong place. Your job also holds as much spiritual significance as that of a pastor or preacher. We often feel that only pastors are called into their roles and that other roles are less significant. However, the word ‘vocation’ comes from the Latin word ‘voca’ which means ‘to call’. This is evidence that at some point in history, people saw their job as a calling. Why wouldn’t they? If pastors are the only ones who are called, then it implies that God only cares about who is in pastoral ministry. However, God establishes and looks after all governing authorities (Romans 13:1) which includes governments, your company’s management and the very role you preside over. If you are in that job, it’s because God called you to be there. Your job holds spiritual significance. 4. Do you see the Grace of God in your work? Maybe you feel purposeless in your job because you aren’t doing it right? Perhaps you feel you work too much, or you work too little? Perhaps you struggle with juggling work, family and rest? Perhaps you feel that no matter what you do, you just don’t fit the job you are busy doing? Perhaps you don’t fit into the culture of the business you are trying so hard to fit into? Whatever it is, you may feel like a failure. If you get question 1 of this blog right, it means you see yourself in Christ. This means you no longer define yourself, God does. He’s the only one who can actually call you a failure. The wonderful gift of God is that he sent his son Jesus to die for all your imperfection. This is such an amazing gift because at the cross, Jesus took all your sin and gave you his righteousness. This brings forth another gift from God and this means, no matter what you do in your job, he sees you as righteous. Knowing this, there is nothing that you can do to ‘fail God’, because Christ is not a failure and he represents you before the father. This means that when you fail at work, you can feel guilty, but not despair for you are not a failure. In Christ you have the incredible gift! Through his grace you are perfect in God’s eyes. You may not experience this perfection now, but you are in God’s eyes. Let that fuel you to pick yourself up and re-evaluate the way you work. 5. Does your life have a purpose hierarchy? Often, we feel like we have multiple roles that fill up our purpose. You may, for example, be a dad trying to run a business and be an active member in your church. You’ll then see your purpose made up of being a working father who serves the local church. The problem comes in when we need to juggle life. You may feel you want to glorify God as a parent, but work is demanding too much time and your service to your church means you are not spending much time with your family. You may feel you are not achieving your purpose. Notice I did not put, ‘time with God’ at the top. This is because time with God happens throughout the hierarchy, i.e. you should find time for God in your family, work, etc. It should be able to change. Sometimes you may need to put your job first, i.e. when you are starting a new job and need to work long hours. However, this should not become the norm. You may similarly need to put church first, i.e. on a Sunday morning. You need to be open about your hierarchy with your family. For example, you may say to them that they are the most important during the week, but on Sunday, church takes up most of the time. It doesn’t mean that they can’t call in emergencies, etc, but they need to gain a healthy respect for your time.